You may order these for August despatch or in the spring. Those listed below are vigorous varieties which blossom early. Their crisp colours and fragrant blooms make a wonderful show in the spring garden. They should be planted in small groups in the rock garden, on dry stone walls or in sunny spots with ample drainage, 6” apart with their rhizomes just above the soil.These tiny iris are just as easy to grow as their taller relatives. They need a well drained soil in full sun. 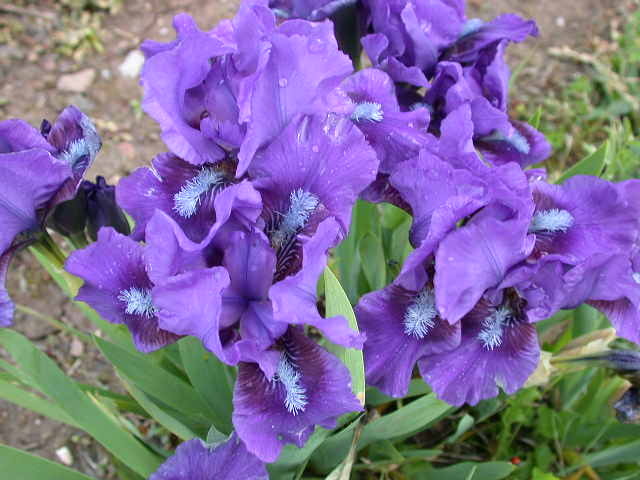 Click Here for an article about growing these delightful iris. See the spring catalogue(available in January) for our full range of iris. Our selection of 5 named iris from among our best growers. All shades and sizes. A wonderful ’starter’ collection.These iris are easy to grow in any sunny well drained soil where the sun can fall directly upon the rhizome. They are perfect for the base of a sunny wall or raised bed.They are very floriferous,producing their large flowers in late April.I grow them under my pleached pears where they associate happily with tulips. Dwarf bearded iris . This is a strong growing cultivar with rich cream flowers and gold marked falls . They make easy plants for the front of a dry sunny bed, top of a wall or on a rock garden. They flower before the tall beared iris. Plant the rhizomes at the surface with the roots going downwards. Dwarf bearded iris This is a strong growing cultivar with white flowers speckled with blue-purple that nearly smother the plant. They make easy plants for the front of a dry sunny bed, top of a wall or on a rock garden. They flower before the tall bearded iris. Plant the rhizomes at the surface with the roots going downwards. Dwarf bearded iris This is a strong growing cultivar with soft lemon-yellow flowers of much substance and a striking orange beard that nearly smother the plant. They make easy plants for the front of a dry sunny bed, top of a wall or on a rock garden. They flower before the tall bearded iris. Plant the rhizomes at the surface with the roots going downwards. Dwarf bearded iris A striking plant with large lemon flowers with pale mustard falls and blue beards They make easy plants for the front of a dry sunny bed, top of a wall or on a rock garden. They flower before the tall bearded iris. Plant the rhizomes at the surface with the roots going downwards. Dwarf bearded iris This is a vigorous variety with deep maroon flowers and a purple beard. They make easy plants for the front of a dry sunny bed, top of a wall or on a rock garden. They flower before the tall bearded iris. Plant the rhizomes at the surface with the roots going downwards. Dwarf bearded iris A delightful intense red-purple dwarf iris with a glowing gold beard. Very dwarf and free flowering - the flowers smother the plant . They make easy plants for the front of a dry sunny bed, top of a wall or on a rock garden. They flower before the tall bearded iris. Plant the rhizomes at the surface with the roots going downwards. Dwarf bearded iris A striking plant with neat white flowers with a hint of yellow in the throat.ing. Very dwarf, vigorous and free flowering.They make easy plants for the front of a dry sunny bed, top of a wall or on a rock garden. They flower before the tall bearded iris. Plant the rhizomes at the surface with the roots going downwards. Dwarf bearded iris Large, well-formed flowers with soft apricot gold falls and ivory-white standards all beautifully frilled. Very vigorous and free flowering.They make easy plants for the front of a dry sunny bed, top of a wall or on a rock garden. They flower before the tall bearded iris. Plant the rhizomes at the surface with the roots going downwards. Dwarf bearded iris Large, creamy-white flowers with pale lemon-yellow veins on standards and falls. Most unusual. Scented. Very vigorous and free flowering.They make easy plants for the front of a dry sunny bed, top of a wall or on a rock garden. They flower before the tall bearded iris. Plant the rhizomes at the surface with the roots going downwards. Dwarf bearded iris Very dwarf. Golden yellow with a dramatic mahonany thumbprint on the falls. Very vigorous and free flowering.They make easy plants for the front of a dry sunny bed, top of a wall or on a rock garden. They flower before the tall bearded iris. Plant the rhizomes at the surface with the roots going downwards. An intermediate bearded iris with striking deep black-red flowers with a brown beard. A perfect foil for tulip Queen of Night. Very vigorous and one of the all time best. Easy plants for a dry sunny bed - top of wall or rock garden. Plant the rhizomes at the surface with the roots going downwards.. Dwarf bearded iris A delightful iris with beautifully formed creamy flowers with a lemon mark on the falls. Dwarf and free flowering - the flowers smother the plant . They make easy plants for the front of a dry sunny bed, top of a wall or on a rock garden. They flower before the tall bearded iris. Plant the rhizomes at the surface with the roots going downwards. Dwarf bearded iris A delightful intense purple dwarf iris with velvet purple horizontal falls. Very dwarf and free flowering - the flowers smother the plant . They make easy plants for the front of a dry sunny bed, top of a wall or on a rock garden. They flower before the tall bearded iris. Plant the rhizomes at the surface with the roots going downwards. Dwarf bearded iris A delightful darf with dusky-rose flowers with deep magenta falls. Very vigorous and free flowering.They make easy plants for the front of a dry sunny bed, top of a wall or on a rock garden. They flower before the tall bearded iris. Plant the rhizomes at the surface with the roots going downwards. Dwarf bearded iris This almost defies decription. It has large white flowers heavily suffused with bright violet veins with a lemon and russet centre. Striking and very unusual. Very vigorous and free flowering.They make easy plants for the front of a dry sunny bed, top of a wall or on a rock garden. They flower before the tall bearded iris. Plant the rhizomes at the surface with the roots going downwards. Dwarf bearded iris One of the smallest with tiny imperial purple flowers. Velvety falls and a good blue beard. They make easy plants for the front of a dry sunny bed, top of a wall or on a rock garden. They flower before the tall bearded iris. Plant the rhizomes at the surface with the roots going downwards. One of the new race of bearded iris. Although only 14" tall it has up to 4 perfect miniature flowers scattered up the stem. A gentle mix of purple shades. Absolutely delightful Easy plants for a dry sunny bed , top of wall or rock garden. Plant the rhizomes at the surface with the roots going downwards.. Dwarf bearded iris This beautiful iris really lives upto its name. It is a wonderful shade of pale peach mixed with lavender-pink and ochre. Very floriferous. They make easy plants for the front of a dry sunny bed, top of a wall or on a rock garden. They flower before the tall bearded iris. Plant the rhizomes at the surface with the roots going downwards.. Dwarf bearded iris This beautiful iris is a striking combination of yellowish-blue with a strong purple mark on the falls. Blue beard. Almost defies description. Floriferous. Dwarf bearded iris This beautiful iris has flowers with striking rich velvety-purple falls and paler tissue-paper standards. One of the best, absolutely covered in flowers. Sightly later than most. Floriferous. Dwarf bearded iris This beautiful iris lives up to its name with neat flowers of clear sky blue that almost smother the plants. Dwarf bearded iris This is one of most beautiful dwarf iris with masses of pure white flowers that smother the plants. Each flower has a striking blue eye on the falls which are held horizontally. Dwarf bearded iris. Strongly scented. The beautiful golden flowers swamp the plant.Easy plants for a dry sunny bed - top of wall or rock garden. Plant the rhizomes at the surface with the roots going downwards.